Apple's second special big event of the Year 2014 after World Wide Developer Conference (WWDC 2014) is just a few hour away. Apple's September 9, 2014 media press event is going to be start soon at the "Flint Center for the Performing Arts" in Cupertino, CA, USA on Tuesday, September 9 at 10:00 a.m. PDT, Invitations for the event has already been sent out which contains the Apple's Event date i.e. 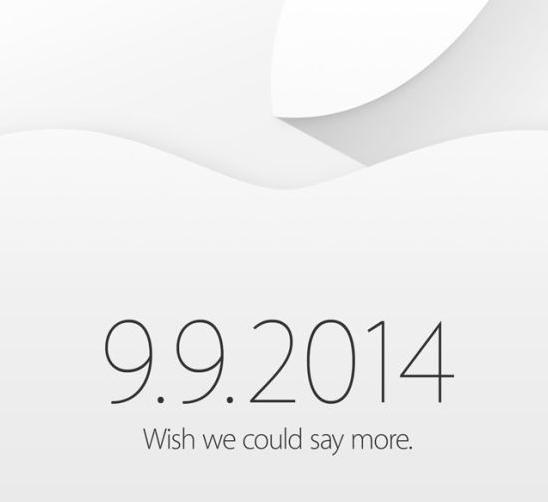 "9.9.2014" and the tagline i.e. "Wish we could say more". You can Watch Live Apple's September 9, 2014 Media Event Keynote via Video Streaming Link on Mac OS X, Windows, iOS, Apple TV and on Apple's Website Officially. Apple's special events followers can stream live online for keynote and official announcements. For remotely live steam to Watch Apple Sept. 9, 2014 Media Event, users will be required following Apple hardware and software installed i.e. For Mac PCs / Laptops: Safari Web Browser v5.1.10 or later on OS X v10.6.8 or later. For Windows PCs / Laptops: QuickTime v7 Software installed. For Apple TV: 2nd Generation or 3rd Generation Apple TV with software v5.0.2 or later. For iPhone, iPad and iPod Touch: Safari Web Browser on iOS v6.0 Firmware or newer. People can visit the following Apple's website link to officially stream Sept. 9, 2014 Event Keynote Live on September 9th, 2014 at 10:00 am PDT (Pacific Time) or 1:00 pm EST (Eastern Time). We at TechGlobeX, will cover the Apple's special event and will provides all the latest updates of announcements, sessions, videos, and keynotes details on the expected releases i.e. 4.7-inch iPhone 6, 5.5-inch iPhone 6, iOS 8 Firmware, iWatch, OS X Yosemite 10.10, Sixth-Gen iPad Air 2 6G etc. So keep Follow Us!